Twice in the past few days I've found myself thinking about Tinkerbell makeup. This range of children's beauty products was a key part of my childhood. 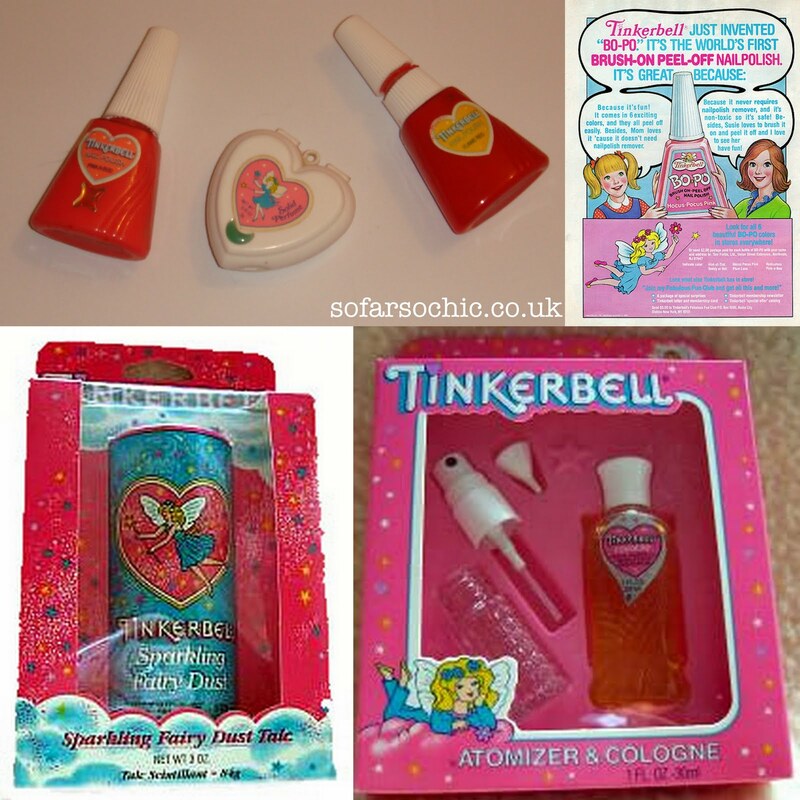 Every powder puff and lip balm was scented with the same distinctive Tinkerbell perfume. The peel-off nail varnish was my favourite product. Sadly, following a legal dispute with Disney in the 90's, the range no longer exists. I'll always have very fond memories. 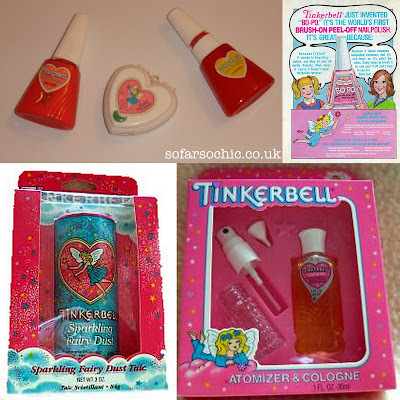 Do you remember Tinkerbell products? 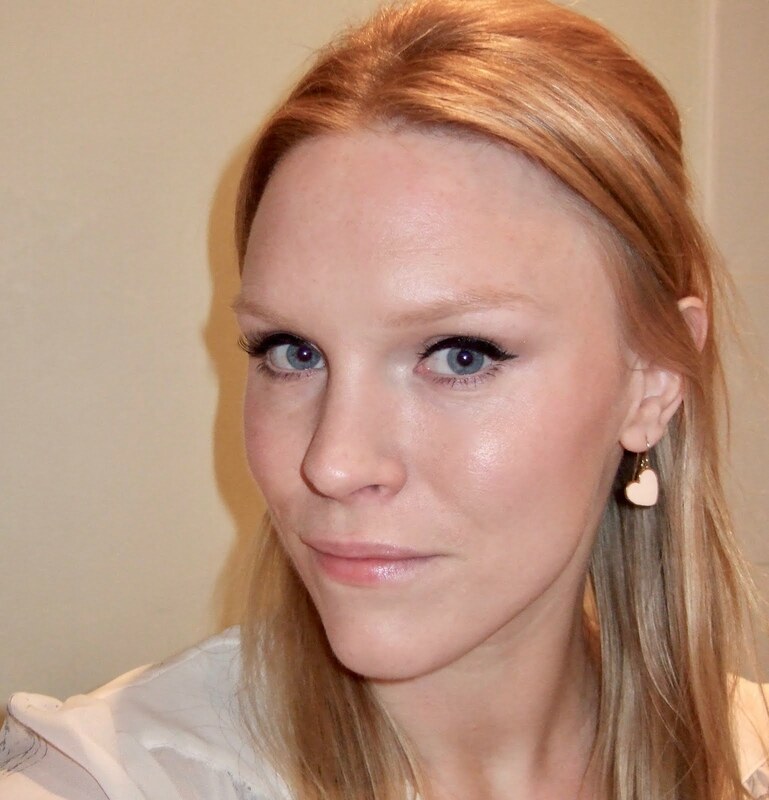 Wow, I had completely forgotten about these, thanks so much for the reminder - I LOVED Tinkerbell make-up! The nail varnish was so much fun for putting on and then peeling off about 20 minutes later - and then repeat. I loved these, I've been hunting eveywhere for peel off varnish for my 3 year old. No-one seems to make it any more. Unless you can tell me otherwise? I use an undercoat (Sally Hansen miracle cure) and then put whatever I want over top. The undercoat peels off really easily and there are no stains left behind. I use this on my little sisters nails all the time. Awhhh!!! I used to LOVE the talc with fairy dust in it!! It smelt amazing!! We should write to Disney to make some more! Oh I loved Tinkerbell make up! It reminds me of my first ever trip to London when I wore the peel off polish! The smell was so distinctive. I never had this stuff but I remember using other kids' peel-off nail polish when I went to their houses to play. It was really satisfying to pull off your nails. Thank you for taking me down memory lane! :) I LOVED Tinkerbell makeup and nail polish. I have been searching to buy the original tinker bell make up.If anyone knows how to get it or where to find it please let me know. I LOVED Tinkerbell stuff. The peel off nail polish came off in the bath. I have very distinct memories of all of it. I keep randomly checking ebay for it. Nothing yet. I've been looking for this too...any luck finding somewhere that sells it? Afraid not! I think Disney ensured it was no more. Have been thinking about my collection of Tinkerbell Makeup all day long! A woman at work was wearing some kind of perfume, and it smelled just like the Tinkerbell cologne! I couldn't track her down to ask her what she was wearing, but wow did that bring back some memories. Any idea what the cologne was made of? Maybe there's a decent facsimile of it out there. I've no idea, sorry. I bet I would love the smell too though!